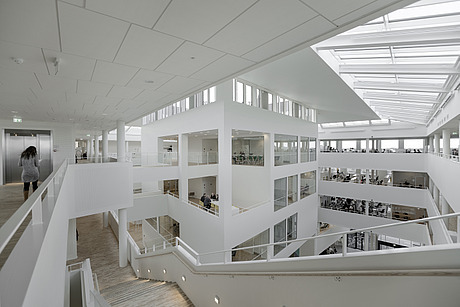 Bo Bolther, who lives and works in Copenhagen, studied architecture at KADK in Copenhagen and photo journalism at the Danish School of Media and Journalism. Bo has been working in photo reportage and architectural photography for 15 years using journalism and narrative photography as the starting point for the way he portrays architecture- seeing architectural ideas and intentions as narratives about human behaviour. He believes that his role as an observer is to emphasise the intentions that are embedded in our environment and to document the way people inhabit space. For his profile shot, Bo has chosen his shot of Egedal Town Hall and Healthcare Centre in Denmark by Henning Larsen Architects: "In my photography I try to capture the way people inhabit space and the intentions that the architects put into their work. Concerning the way we wish to live and interact with each other in our homes, public spaces and workplaces. To me the picture captures the lines and light of the building and at the same time shows how the people who work there use the building."